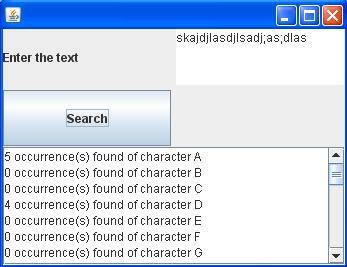 Write a Java GUI application called Index.java that inputs several lines of text and a search character and uses String method indexOf to determine the number of occurrences of the character in the text. This program is not case sensitive and both upper and lower case must be counted for. 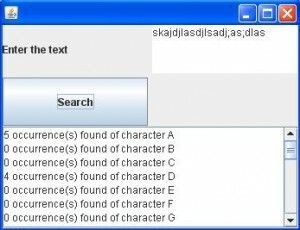 Write a Java GUI application Index2.java based on the program in Step 1 that inputs several lines of text and uses String method indexOf to determine the total number of occurrences of each letter of the alphabet in the text. Uppercase and lowercase letters should be counted together. Store the totals for each letter in an array, and print the values in tabular format after the totals have been determined. Write a program called ThreeArrayLists.java that declares three ArrayList objects referenced by the objects named priceList, quantityList, and amountList. Each ArrayList should be declared in main()and should be capable of holding a minimum of 10 double-precision numbers. 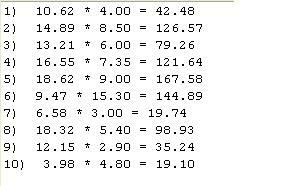 •	The numbers that should be stored in priceList are 10.62, 14.89, 13.21, 16.55, 18.62, 9.47, 6.58, 18.32, 12.15, 3.98. •	The numbers that should be stored in quantityList are 4, 8.5, 6, 7.35, 9, 15.3, 3, 5.4, 2.9 4.8. Your program should pass object references to these three ArrayList objects to a method named extend(), which should calculate the elements in the amountList ArrayList as the product of the corresponding elements in the priceList and quantityList ArrayList, for example, amountList.add(priceList.get(i) * quantityList.get(i)). After extend() has put values into the amountList ArrayList object, create a method that displays the results of all three lists. Appropriate formatting techniques need to be used to produce a formatted output.